A scheduled strike in Sunnyvale has been called off after city leaders and the employees union reached a tentative agreement Monday morning following a contract dispute. Kris Sanchez reports. A scheduled strike in Sunnyvale has been called off after city leaders and the employees union reached a tentative agreement Monday morning following a contract dispute. Some workers in Sunnyvale planned to walk off the job Monday after pay raise negotiations stalled late last week, but both sides came to terms early Monday, according to city officials. The specific terms of the agreement were not immediately available. Santa Clara County Supervisor Cindy Chavez was credited with crafting a resolution, according to the Sunnyvale Employees Association. SEA officials on Friday rejected the city's last financial offer, effectively ending last-minute negotiations between the two sides. With no agreement in place, the employees union and its members planned to not return to their posts after 12:01 a.m. on Monday, sources said. On Sunday, Mayor Glenn Hendricks described what people could have expected had the strike prolonged. "An impact will be on our planning department, people who are getting inspections if they are doing home remodeling, library services and parks," he said. 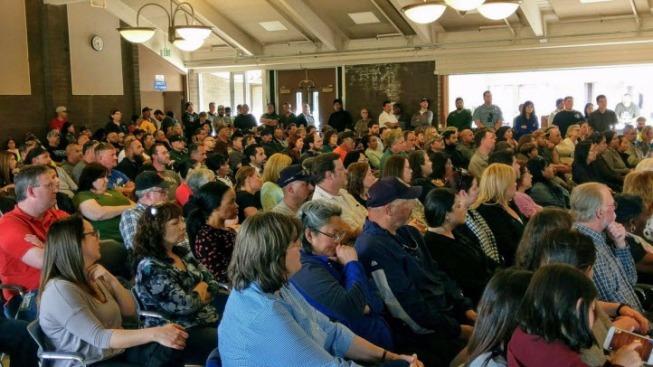 Sunnyvale city leaders said they offered workers a "10 percent raise, a continuation of paying a 30 percent pension contribution, and a $6,000 signing bonus to employees who make an average of more than $120,000 in salary and benefits." Union leaders rejected that proposal. City officials said union members demanded a raise that would equate to Sunnyvale handing out an additional $82 million over the course of the next two decades. The union had been pushing for what it called a long-delayed pay raise that stretched out over years. Some members told NBC Bay Area that they agreed to not getting a raise to help the city through hard financial times and want compensation now that city is doing better. During the scheduled strike, emergency services and garbage service would not have been impacted, according to city officials. Residents wishing to learn more about the strike are encouraged to visit the city's website.